DIY Biking | How bike builds, bike travel and bike life can save the world: So...How Did That National Bike Month Challenge Go? So...How Did That National Bike Month Challenge Go? So for National Bike Month 2013 - sponsored by The League of American Bicyclists - I gave myself a challenge: Ride a $20 garage sale bike 112 miles - which was the minimum distance it could pay for itself. After all, the whole point was to use the $20 bike (a red Peugeot) on every trip I would normally use the car. There would be no usage of the bike on pleasure trips and no excuses. No excuses at all. I failed miserably. But hear me out. First off, I didn't give myself the challenge until bike month was almost a third of the way over. That severely cut into my clock. There are only so many trips I can make that are practical and not padding. Secondly, there was a lot of crummy weather in May, and I tend not to ride in crummy weather. And due to a busy month at Grown-Up Land, I often had to take the slightly faster way to the office. Too often, a forecast kept me in the car on the way to work but I'd simply mutter curses on the way home because rain never materialized. As I soon learned, I couldn't even trust the forecasts: the picture below is real, and I am really interested in knowing why an inquiry for 06902 came out different on an iPad versus my Droid Incredible 2. But I rode the bike to work several times (7 miles round trip, and in downtown Stamford it is only about five minutes more to get to work to bike and a few minutes less time to get back home) and to Fairway Market grocery store. One day I pedaled to Dinosaur BBQ for a take-out order. It was one of the many times I wished Dinosaur BBQ and their addictive chipotle garlic wings were further from my house. Last week, as it was clear National Bike Month was coming to an end, I realized I had an easy way out: I needed to go to New York City (which I did and was excited to see the CitiBikeNYC plan in use) planned to ride to the Stamford train station instead of drive, which would have automatically meant I would have saved $8 by not parking - which would have gone a long way to pay for the Peugeot. But unfortunately, actual rain (not a questionable forecast, but large drops of water falling from the sky) kept me off the bike. But on Friday, the last day of National Bike Month, I left the house early, wearing padded bike shorts, a loose jersey, No. 30 sunscreen, and a filled water bottle in the cage. My plan was to ride to Rowayton and pick up 16 screws and 16 washers from the Rowayton hardware store. It was to be the longest ride taken on the Peugeot, and if the mood struck I'd try for an errandpalooza to make up the miles. I learned something early on this ride. The $20 Peugeot is a pretty nice way to get around. The one piece of equipment I didn't like on this non-suspension bike is the seat, which is quite anvil-like. If I wanted to cheat on this challenge I would have put on the Cane Creek Thudbuster seat post or any seat that felt more comfortable. But for that day, the padded shorts really made a difference. In fact, I moved rather gracefully the eight or so miles to the Rowayton Hardware store. 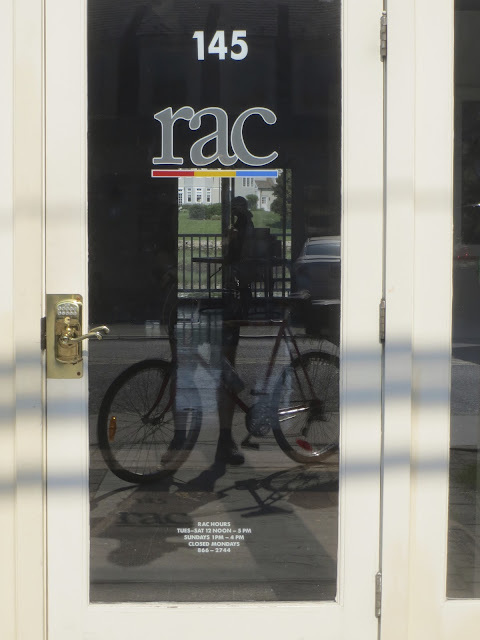 Unfortunately, it was still closed. Unsure when it would open, I reached for my phone…and then realized I had left it on my desk at home. So I was on an old bike with no tools without any means of contact. But the risk was limited since I was in Rowayton, which has a lot of friendly people. After all, the Rowayton Arts Center, located just across the street, was the gallery that had accepted my 'No Words' sculpture for the Expressions exhibit back in January. 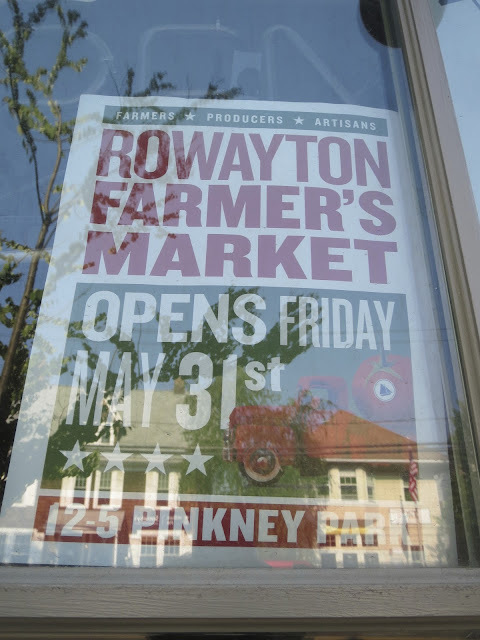 A few paces away is the Rowayton Market, which has outdoor seating in front that is reserved for cyclists smart enough to bring plenty of water and their own cell phones. Wanting to be away from the sun, I bought a coffee at the little bar in the rear of the store and sat outside on the back porch, where the shade of the building kept me reasonably cool as I looked out onto Five Mile River. I had nothing else to do since I didn't have my phone. After getting an answer from a friendly woman as to when the hardware store was to open, I returned to the front to stake it out. Looking around, I noticed a sign for the Rowayton Farmer's Market, which was to begin that afternoon. The store opened promptly at nine, and I entered to get my 16 screws and 16 washers. Packed in the bike box, I swung up the street to check out a tag sale. Realizing that not having a phone would not be a good thing for errandpalooza, I returned home and checked the final milage. Ignore the elevation number: I wasn't in my underground lair and the aging Garmin must have been a bit confused. Inside my home, my wife playfully reprimanded me for forgetting my phone, but was happy to know the Rowayton Farmer's Market was open since, as it turns out, we needed to go to Rowayton to drop off two of her paintings for a Rowayton Arts Center show (through this Friday they are having their Paint Rowayton Plein Air Show at the Portside Gallery - and two of my wife's paintings are on display there). Even though we were forced to use the car for that trip, the blow was cushioned by some really sweet desserts we bought at the With Love From the Cupboard tent. Before I knew it, the day was caught up in Automotive Errand Creep, and I was forced to call it a National Bike Month with 66.21 miles traveled. It was a bit disappointing that I couldn't make this a successful challenge, but as the weekend wore on, I realized I was quite happy with the rides I had taken (and just happier in general when I didn't take the car) and I knew this needed to go into overtime. So, today, in order to run another errand I had to put on the DIYBIKING.COM tow package. Yes, Person-to-Person is having another clothing drive on June 8, and I just had to decorate the trailer with that important info before setting off. 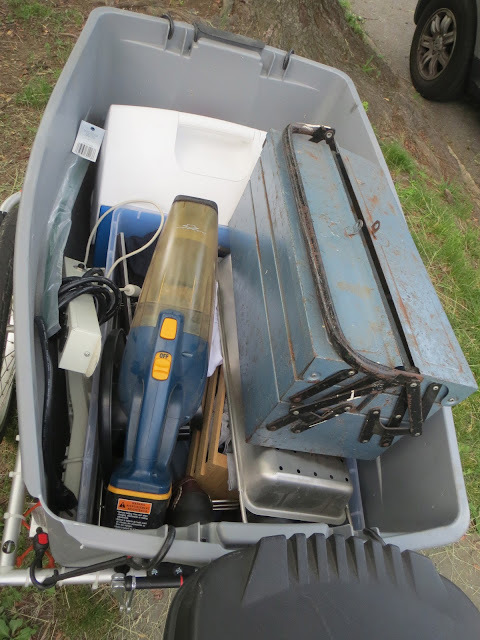 This errand came in two phases: first I had to run a load of stuff to Goodwill - some of it from an Ugly Shop Reorg (more on that later) but most from the kitchen renovation nightmare. This afternoon I set off eyeing the sky warily. I could hear thunder in the distance and my neighborhood did get approximately 0.00004 inches of rain in a two-minute period earlier in the day, which made me nervous. Turned out, I was worried about nothing because I stayed dry all the way to Goodwill. I also felt quite smug when I got there: the tiny lot was packed full and there were two cars just sitting there, blocking the entrance, waiting for a parking space to open up. The Stamford Goodwill, my readers, is never a problem if you bring your bike and tow package. The second phase of the errand was a stop at Fairway, which, to my great annoyance, still hasn't replaced the bike rack in the spot next to the wine store. Still, with nothing in the trailer I arrived in record time. In the past I have found that one can, in fact, carry an entire Thanksgiving dinner on a bike. But this time I only needed a few things. I even bought eggs. I wasn't even sure if I needed eggs. I just wanted to see if I could get them all back unbroken. So the moral of the story is that, once again, I failed to go 112 practical miles in National Bike Month. But I picked up a lot of good habits along the way and am finding myself thinking even harder about ways to use the car less the other eleven months out of the year. Remember: if I can bring a dozen eggs back from the grocery store unbroken and bring a load of plates and glass bowls to Goodwill intact - you can too. Thanks for reading and thanks for riding. I used to live in Stamdford, CT. I still have many friends and My father owns property. Has Stamford Made the city more bike friendly?